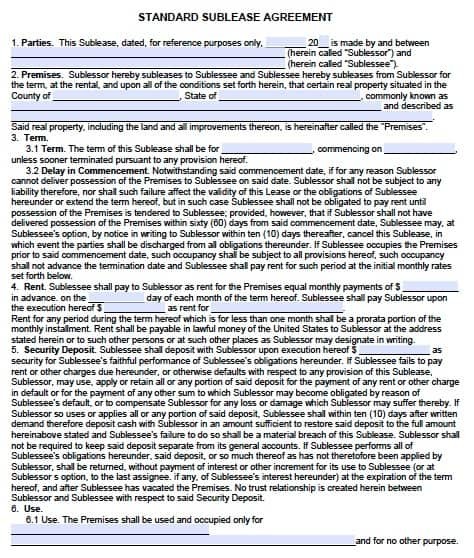 Download the Maryland sublease document in Adobe PDF (.pdf) that lets a tenant currently under a lease be able to rent the property to someone else (sublessee). The tenant may either rent a portion or the entire space to the sublessee or in return receive any rent amount (does not have to be the same as the rent in the original lease agreement). The original tenant should be aware that any non-payment of rent by the sublessee does not constitute the landlord not being paid. The original lease agreement is still intact and the landlord must be paid the same amount and on the due date agreed upon. Also, if the sublessee is not vacated the premises and must be evicted the original tenant must take care of all legal costs associated with the process. Therefore, it is highly recommended that all potential sublessee’s be screened through the use of a rental application.